The Chinese government has finally responded (at least in a more formal way), and they’re clearly not happy — no surprise there. But what is kind of surprising is that Google is sort of backing down now. Well, maybe not so surprising. But a bit disappointing. Tonight, David Drummond, Google’s top legal executive, has written a post outlining Google’s “new approach” to China. 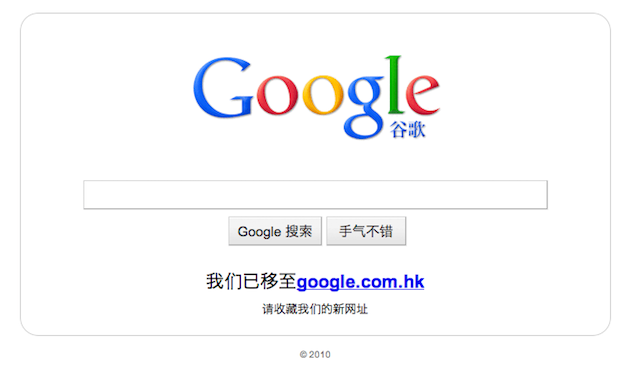 Basically, they’re ending the redirect from google.cn to google.com.hk — and restarting the Chinese Google page. But instead of being the full (and fully censored) site that it once was, Google is making it into a completely degraded search engine (think: music and text translation), and instead providing a link to the Hong Kong Google site (which is not censored at all). Google’s position is clearly that’s they’re not ready to fully give up on China just yet. While they’re still refusing to censor (which Chinese law requires), they are willing to stop the redirect which China finds “unacceptable.” Why? Because if they don’t, China won’t renew the Internet Content Provider license — google.cn will cease to be. On one hand, I obviously understand why Google is making this pivot and slightly going back on their powerful action. On the other hand, as I noted above, Google clearly knew the risks it was taking with their actions — they did them anyway. That’s what made the move seem so ballsy and brilliant. But, of course, that was before the first real punch was thrown. Now that it has been, and they’re flinching — no matter how slightly — the actions seem less ballsy, less brilliant. Again, this is all easy for me to say without having to worry about Google’s business prospects and their Chinese user base. But the power of Google’s initial message was anchored by the fact that they said they were ready to leave China and shut down google.cn if it came to that. Now that it has come to that, and it’s clear they’re not going to do that anytime soon, it’s just a little disappointing. Is giving Chinese users access to a neutered search engine and a link a more powerful message than having them go to google.cn and finding it not working thanks to their government? I don’t think so.